It wasn’t a competitive Startup Weekend or a frantic 24-hour game jam. CodeAcross Seattle was more unconference than hackathon. Over 70 technologists, designers, government staff, writers, researchers, and others teamed up for eight hours to work on projects related to open data and civic technology on February 22, 2014 at the Google offices in the Fremont neighborhood of Seattle. People broke out into teams to work on predetermined challenges, but also to work on ad-hoc projects that popped up based on the interests of the attendees. And instead of being stuck with a single project, folks spent time working on the projects they felt they could best contribute to or learn the most from, switching between projects as needed. Teams wrote code, but they also drafted an open data policy, edited wiki pages, designed civic icons, and worked on mapping projects. Shelly Farnham, a researcher at Microsoft’s Fuse Labs talking about her research on how we can measure the social impact & well-being of citizens using open data and social media. Neil Berry, a city employee who manages data.seattle.gov spoke about the role of Seattle’s open data portal and how developers can request data that isn’t currently available on the portal. Matt Rosenberg, who runs the Public Data Ferret, spoke about the role of open data, the importance of releasing data in usable formats, and how civic hacking isn’t so different from journalism. Luis F. Borrero, chief architect of DRiVE, a tool for visualizing data on Google Earth, discussed the challenges of creating a company around open data. Carter Rabasa from Twilio, demonstrated how to use their service to making phone calls and SMS messages with code. The projects at CodeAcross Seattle were diverse. Take a loook at the list below to get a sense of what people worked on and how you might be able to contribute now. Does Seattle have an open data policy? Nope! It’s important for an open data policy to exist so that civic data remains open and current, and during CodeAcross a team started an open data policy for the City of Seattle. A team audited the available open data available from the city. Seattle is currently ranked #6 of the 21 cities that have been inventoried so far. They created a list of local (Seattle city) data sets on a sub-set of topic areas that will be available on US City Open Data Census. Need to work with Socrata, and will need to provide the data set to the national organization for compiling as the result of today’s event. 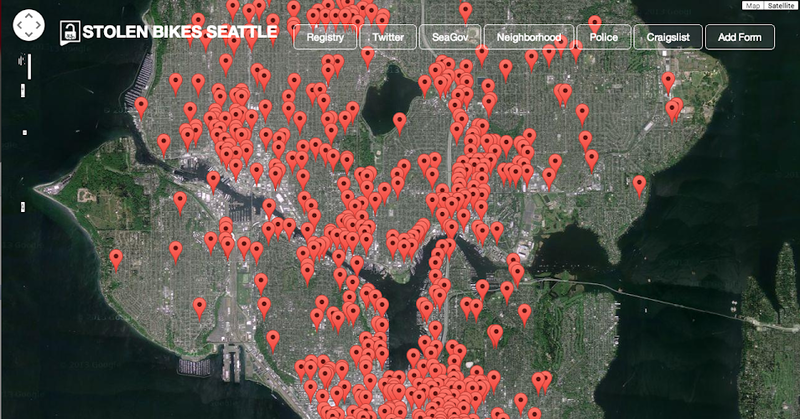 Sourcing and aggregating stolen bike data for Seattle, with a particular focus on geographic areas of high bike theft. Then a data visualization of the concentration of bike thefts, with heat maps and street maps for example. It’s not easy to get a sense of the impact of the proposed Metro bus cuts, so a team created a visualization to make that easier. 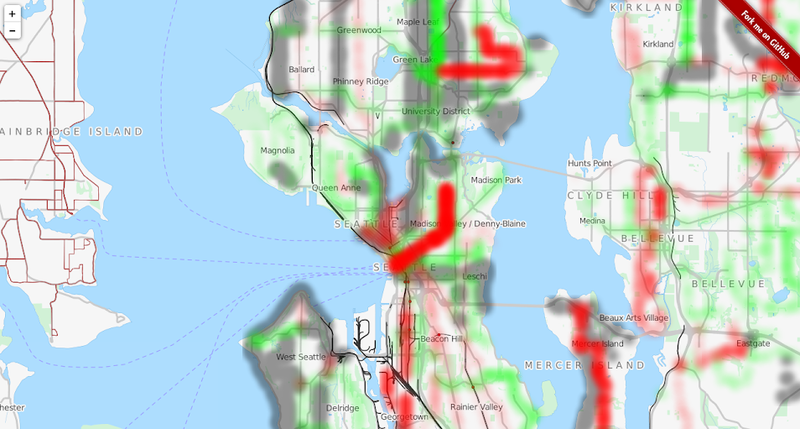 With this map you can spy the real-time location of busses around Seattle! Building off of One Bus Away Application. They want someone with UE/UI/UX experience, and visual design skills for the animation. Also someone to do the coding review. Wouldn’t it be great if we had icons for the neighborhoods, landmarks, city services, and other notable entities in Seattle. After CodeAcross we’ve got a start to this project, and at follow-up events designers will turn the sketched ideas into SVG icons with a Creative Commons license. Provide the icon access via local channels to the community both on and offline, so that all members regardless of access or knowledge of technology may be aware or make use of icons. The goal of the BPS project is to facilitate getting real data on broadband performance. Compile data on local internet speed which can then be used to better negotiate internet service and access, as well as provide general awareness as to if broadband performance is comparable to the value described in the service being sold. They need sales and engagement individuals to help spread the word about the survey in order to build a bigger data set. They need help with word of mouth and marketing to get more people participating in providing their personal internet speed data. They would like to have the survey and results published on the Seattle city website. They ultimately want to ensure that consumers understand what they are paying for and the actual speed of the internet that they end up receiving. iPhone mobile application help. GIS knowledge to help with city park data sets. The goal is to create a membership database that can be centralized for the City chamber, with an app specialized for each chamber to pool neighborhood chamber data. Beyond writing the database and interviewing other local chambers to determine the individual data sets they want, they are going to create robust requirements and try to create a consistency of data. Building a team with more tech coders and they need non-technical interviewers to speak to other chambers, and graphic designer for certain elements of the project. This is an ongoing project that is beyond this event. They want to build a reliable CRM ultimately with the input of other neighborhood chambers, which can also provide up to date information on specific business members, and spread accurate information on events and projects. Create a scraper tool that can scrape local legislator information, and compile the contact information in a single source for Seattle. There are pre-existing plug-ins for cities who have already done this project. They are going to find a successful plug in to the Seattle city servers in order to scrape this data for public consumption. At this point they are just going to continue to test plugins until they can match with the Seattle servers. Ultimately they will have use for people interested in using the plug in to scrape data for their own city and municipality. Helping to edit and build out SeattleWiki.net, which is like a hyperlocal Wikipedia, that specializes in Seattle specific topics. Especially topics that would not be considered relevant enough for the broader Wikipedia site. Check out more photos of the event! These three organizations partnered to create the national CodeAcross event. Thanks to the national sponsors of CodeAcross! You can edit this post on GitHub if we missed anything!